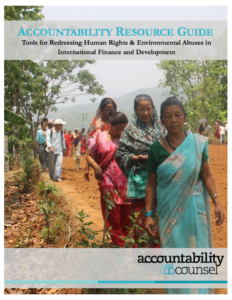 Our Accountability Resource Guide (8th edition) contains information about tools for redressing human rights and environmental violations by international financial institutions, export promotion agencies, and private corporate actors. 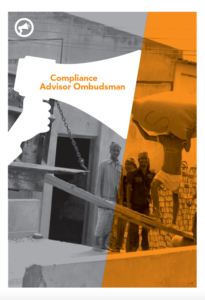 The guide is intended to assist community leaders, lawyers, NGOs, and individuals in determining what rights they have and how to file a complaint when those rights have been, or may be, violated. The guide also discusses information disclosure rules at the international financial institutions. 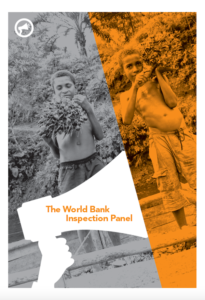 investigate whether the institution’s own policies or procedures have been violated by the institution and whether those violations have caused or are likely to cause harm to people or the environment. 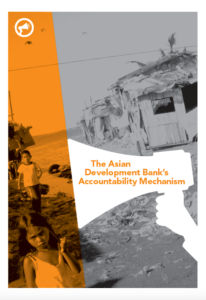 Finally, the accountability mechanism issues a public report with their findings of the investigation and recommendations, if any. In general, the institution’s President or Board of Directors has the final say about what will be done about the project. What is the source of the harm and who are the actors involved? Who is affected by the project? Are there community relations or dynamics you need to be aware of? Who will speak for and lead the group? How will decisions be made by the group? What is the end goal you wish to accomplish? What are realistic expectations for possible outcomes of filing a complaint? How much time and what resources are available to you? For more information on each of the above questions and considerations, please see the “Strategic Considerations” section of the guide. Asserting your rights, regardless of the tools chosen, can be long, drawn out, and frustrating. However, if expectations are realistic and it seems reasonable to engage one of the mechanisms nonetheless, it may be worth the time and effort. 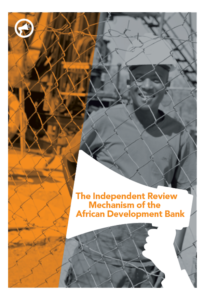 For detailed information on the World Bank Inspection Panel, the Independent Review Mechanism of the African Development Bank (AfDB), the Compliance Advisory Ombudsmen (CAO) of the International Finance Corporation (IFC) and the Multilateral Investment Guarantee Agency (MIGA), and the Accountability Mechanism of the Asian Development Bank (ADB), please see the following guides produced in partnership with SOMO.